The July 2011 monthly unemployment figures show the official unemployment rate decreased to 9.1% and the total jobs gained were 117,000. Total private jobs came in at 154,000 with government jobs dropping -37,000. Those entering not in the labor force increased by 374,000. The labor force participation rate dropped -0.2% to 63.9%. This is the lowest labor participation rate since January 1984!. The civilian labor force dropped -193,000 while the civilian non-institutional population increased by +182,000. 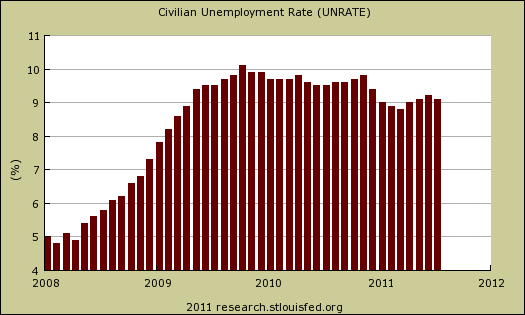 What this means is even more people dropped out of the count for July and are not tallied into the unemployment rates. U6, or the broader unemployment measurement, decreased -0.1% to 16.1%. By every indicator we can gleam from the monthly numbers the situation is horrific, with people dropping out and those still counted increasing dramatically. Below is the nonfarm payroll, the total number of jobs, seasonally adjusted. Since the start of the great recession, declared by the NBER to be December 2007, the United States has officially lost 6.79 million jobs. That does not take into account additional jobs needed to employ the United States increased population, but does include the jobs added over the over 3 and a half years, or 43 month time period. Below is a running tally of how many official jobs permanently lost since the official start of this past recession (recall the private NBER has declared the recession over!). This is a horrific tally and notice this isn't taking into account increased population growth, which implies the United States needs to create at least 10.98 million jobs or self-employment. This estimate assume a 62.7% civilian non-institutional population to employment ratio, as it was in December 2007, which implies an additional 4.19 million jobs needed over a 3.42 month time period. If one takes the current civilian non-institutional population and the December 2007 to employment ratio and then subtracts off the current number of payroll jobs, assuming one job per person, which is false, some people work 2 and 3 jobs to get by, the number of jobs to get to pre-recession levels is much worse, 19 million jobs. This doesn't take into account population fluctuations, for example, those retired percentages increasing. How can the unemployment rate decrease? The official unemployed decreased by -156,000, alternatively the employed decreased -38,000. The actual labor force dropped by -193,000. The employment to population ratio dropped -0.1% to 58.1%. With 374,000 dropping out of the count of the labor force, the -38,000 drop in employed people still decreased the official unemployment rate by ratios. You may notice these population and labor force numbers which make up the unemployment rate exceed the actual number of jobs created, 117,000. The BLS has two different surveys, two different methods, and additionally is counting other types of work beyond payroll. These numbers are from the household survey whereas the actual job count is from the establishment survey. Below is an annualized graph of civilian institutional population. It's from this superset of people that potential workers come from. The civilian labor force decreased by -193,000, while the civilian population increased by +182,000. Yet those not in the labor force increased by +374,000. This means a lot more people dropped out of the count. The civilian non-institutional population are those 16 years or older not locked up somewhere or not in the military or so sick and disabled they are in a nursing home and so on. The increasingly low labor participation rate is now at 63.9%. If we go back to December 2007, the labor participation rate was 66%. The highest civilian labor participation rate was in January 2000, at 67.3%. What this means is there are over 5.03 million people not be accounted for in the official unemployment rate, in other words counted as employed or unemployed, who probably need a job and can't find one. No, they are not all baby boomers retiring (many who cannot retire due to having no retirement money). The employment to population ratio is now 58.1% which is at record lows. You have to go back to July 1983 to find such low ratios. This was when a severe recession occurred. The uber-low ratios are not a structural change, such as all families decided to have a stay at home caretaker, or magically a host of people could retire early, this is people dropping out of the count. They need a job, but stopped looking, fell off of the rolls, stop being counted. These numbers are important because unemployment is a ratio, percentage or during a limited time period, the number of people actively looking for a job and counted. Many people are not counted in the official unemployment statistics, due to definitions, but obviously when one has more potential workers and less jobs, that metric doesn't bode well for America. Below is the graph of the civilian non-institutional population, which is the largest super-set of the potential labor force, larger than the civilian workforce, due to those who are not looking for work, retired and so on being counted in this figure. This is why one must create jobs greater than the constant rate of jobs lost. There are more people to employ. Unemployment is a percentage, a ratio. The BLS unemployment report counts foreign temporary guest workers as well as illegal immigrants in their U.S. labor force statistics. One needs at least 98,000 and some estimate up to 375,000 permanent full time jobs, added each month just to keep pace with U.S. civilian workforce population growth. That's not general population, that's the group needing a job. This unemployment report doesn't even give enough jobs to keep up with population growth. It's so dismal maybe now, politicians will realize we have a jobs crisis going on for over 43 months! what do you wanna bet that there is a big revision next month on this phoney data. the american markets are a total scam. the SEC & the CFTC are run by the very criminals that they are supposed to be regulating. i say, bring back william black and start putting the banksters in jail. I think we need better raw data collection and larger sample sizes. That....would be up to Congress and this administration to improve the statistics of the BLS and that....gets into their inane politics. If they would simply take some recommendations from statisticians to improve accuracy, that would be great, but you know they will not. That's why I run through a series of calculations as an exercise. Bottom line the payrolls number is more accurate and bottom line all of the ratios are problematic because first and foremost, they rely on Census data, which still has not been updated to the 2010 base values, plus use statistical models to extrapolate out the monthly change....which is why the BLS warns on comparing monthly and weekly numbers. The CPS survey IMHO is much too small, about 60k and the actual survey questions, methods I think could be greatly improved. As far as I know, they have not incorporated, in the least, online, Internet, digitized technologies in data collections as well. So not only blame Congress for lack of funding, but really blame Congress and the executive branch for wanting to increase the lies buried in statistics. The BLS, at least from the economic report side, are just a bunch of geeks running some numbers, math heads. I'm seeing other sites imply that the survey reference week was before the great Debt ceiling charade and this is why the unemployment report isn't as bad as expected. Honestly, seeing jobs decline over that insanity, it might affect the overall trend, but I'll assume more we're looking at revisions and even possibly the seasonal adjustment algorithm needing to be re-adapted. Also, the pay roll numbers are almost in the margin of error. < 100k jobs is a small amount by the total. If anyone wants an overview of error margins and diffusion indexes I can do dig into that. Why isn't this the #1 issue we're facing. To borrow a famous saying, "Oh, the people have no jobs, let them party with President Obama." From Tea party crazies to Obama, they bold face, promote policies, bills that will lose more jobs. It's disgusting. From bad trade deals to corporate squeeze the little guy out patent changes to deficit reduction to even infrastructure plans, they refuse to actually craft policy that would create jobs and most of the time will lose jobs. Also, from the 11 million jobs to 19 million jobs needed, there are many ways to calculate out how many jobs are needed and different assumptions, so I hopefully show the reasoning behind each number and give some examples as to how these figures are derived. Anyway you look at it, even if jobs were through the stratosphere, it's going to take years to get back to full employment. We're all dead. I feel like we're at the end of empire and nobody cares. I haven't had paying work in over four years and, if things don't change soon, I'll be living in a cardboard box. I want to make one thing perfectly clear: it's NOT the politicians' fault. It's OUR fault. WE voted these people in and they instituted the policies that WE wanted them to insititute. Never mistake where the blame goes. Nobody took political power in this country by accident or by coup. We're getting EXCATLY what WE voted for. What you mean 'WE", Johnny?